Google blacklists 10,000+ websites every day. Are you one of them? For most website owners, the security warnings, hack indicators, and diagnostic pages can be daunting. It’s difficult to focus on fixing your hacked website when all of your visitors are being blocked from accessing your site. We compiled this guide to help webmasters remove website hacks and Google warnings so that you can restore your website and reclaim visitors, revenue, and SEO rankings. Your website is blacklisted because Google scanned your site and found harmful behavior. Google needs to protect its users from dangerous websites that show up in their search results. In fact, websites that repeatedly get blacklisted for malicious behavior are limited to only one review every 30 days. That big red splash page (and warnings next to your site in Google’s search results) are designed to stop visitors from entering your site. It works, too. Websites lose about 95% of their traffic when blacklisted by Google. Review the images below and common Google blacklist warnings. Identify the type of warning you are seeing on your site. Follow this guide to fix security issues and request a review. The specific warning message on your site can help you to understand what Google is telling you about the type of security issues they found on your site. This information will be useful in the following sections of this guide. 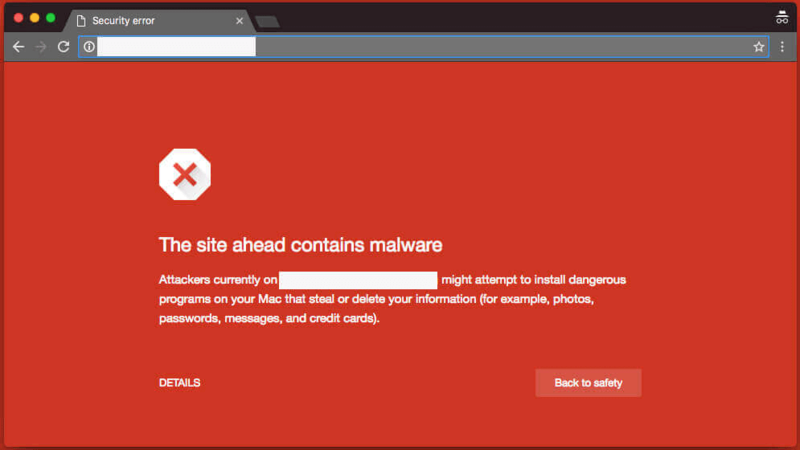 Here are a few examples of common malware warnings that suggest your hacked website is serving malicious downloads such as viruses, spyware, rootkits, and ransomware. Most browsers use Google’s blacklist API, but Microsoft (IE/Edge) have their own. There are a number of phishing warnings, meaning your visitors are being tricked into revealing personal information such as passwords and credit card data. These Google warnings can also mean your site contains malicious advertisements or malvertising. The new unwanted software warning may indicate malicious ads or scams. When your site shows up in Google, warnings in search engine result pages(SERPs) show if spam or redirects are detected on your site. These can also be triggered if your hacked site is used to infect visitors with malicious software through drive-by-downloads. If your site is not showing the red warning page yet, but these warnings appear in your search results, it can indicate malicious scripts and iframes are being loaded from third-party sites.